Here is a ladder representing the “ladder of life.” Let’s suppose the top of the ladder represents the best possible life for you and the bottom, the worst possible life for you. On which step of the ladder do you feel you personally stand at the present time? The convergence in attitudes between middle and high income nations is not due to a significant decline in satisfaction in richer countries, despite the toll the global recession took on advanced economies’ growth rates. Personal well-being changed little in most of the wealthier nations surveyed in both 2007 and 2014, including the U.S., the UK and Japan. A key exception is Spain, where life satisfaction dropped 12 percentage points over the past seven years amid considerable economic tumult. When asked about specific aspects of their lives, publics in nearly all emerging and developing economies are less satisfied with the economic realm, such as their job or standard of living, than with the personal arena, such as family, friends, or religion.3 Satisfaction with their material well-being, though, has the biggest positive impact on their overall happiness. While wealth is a key factor in life satisfaction, it is not the only one, and emerging market publics vary considerably in how happy they are. Latin American countries are much more satisfied than other emerging nations. Argentines, Mexicans and Peruvians are also considerably happier today than they were in 2002. People in the Middle East, on the other hand, are especially dissatisfied with their current life situation.4 Egypt and Jordan, in particular, exhibited some of the largest declines in satisfaction over the past seven years, perhaps due to the political and social upheaval in these countries and the region. When asked about the next five years, Asian and African publics are the most optimistic among emerging and developing countries. People in the Middle East are the least hopeful about the future. The survey also finds that emerging and developing publics prioritize a few key essentials in life, including their health, their children’s education and being safe from crime, with financial security not far behind. Fewer people say internet access, car ownership, free time or the ability to travel is very important in their life. However, young people tend to value internet access much more than the older generation. These are among the key findings of a Pew Research Center survey, conducted in 43 countries among 47,643 respondents from March 17 to June 5, 2014. The question about where people stand on the ladder of life was asked in all 43 countries, and this report generally focuses on the differences and similarities in life satisfaction across economically advanced, emerging and developing nations. All other questions included in the report were only asked in emerging and developing economies, and the analysis on these questions is focused on the significant differences across regions. On average, people in advanced and emerging economies are considerably happier with their life situation than those in developing economies. On a ladder where 10 represents the best possible life and 0 represents the worst possible life, a median of 53% in rich nations say they currently stand somewhere between 7 and 10. Half in emerging markets say the same compared with just about a third in developing economies (34%). Israel, the U.S., Germany and the UK stand out as the happiest among advanced economies, with roughly six-in-ten or more saying they are near the top of life’s ladder. The Greeks are the least satisfied, and the only advanced public where a significant percentage places themselves near the bottom of the ladder (21% saying 0,1,2 or 3). In 12 of the 24 emerging markets, at least half rate their life satisfaction highly. Latin American publics are the most content, with roughly two-thirds or more in Mexico, Venezuela, Brazil and Argentina saying they are doing well. About six-in-ten or more say the same in several Asian countries including Vietnam, China and Indonesia. Middle Eastern publics, such as people in Tunisia, Jordan and Egypt, tend to be the least satisfied among emerging nations. In addition, few Ukrainians are happy with their current life situation, perhaps reflecting the considerable turmoil in their country. In each of these four nations, about two-in-ten or more put themselves at the bottom of the ladder with a rating of three or below, including nearly a third (31%) in Egypt. People in developing economies are much less satisfied with their lives than those in either advanced or emerging nations. In just two of the nine developing countries surveyed do more than half rate their life situation highly. And in four nations, a quarter or more say they are dissatisfied with their life today, including 30% in Tanzania who give a rating of three or below, 29% in Uganda, and 25% each in Ghana and Kenya. Life satisfaction is strongly related to national per capita income, though the relationship is not one-to-one. As per capita income rises in a country, individuals are much more likely to be satisfied with their personal situation. However, the increase in life satisfaction due to national income starts to level off among richer countries. So, while South Africans (49%) are richer and considerably happier than Ghanaians (25%), they are nearly as satisfied as the much wealthier French (51%). Further evidence that higher incomes can improve perceived well-being, at least up to a point, is the substantial change in life satisfaction in emerging markets over the past seven years. In eight of the 14 emerging countries surveyed in both 2007 and 2014, the percentage who say they stand at seven or higher on the ladder of life increased by double-digits. Some of the biggest gains occurred in Indonesia, China, Pakistan, Malaysia and Russia. Egyptians, Ukrainians and Jordanians, on the other hand, are much less happy than in 2007. Looking back to 2002, the increase in life satisfaction is also substantial in Turkey, Argentina and Mexico. 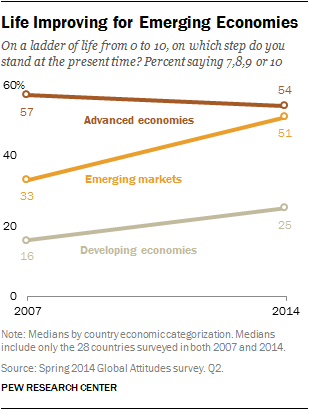 Ratings among developing economies surveyed in 2007 and 2014 improved as well, though less dramatically. Ugandans and Palestinians5 are considerably happier today than seven years ago, but the increases in Tanzania and Ghana were smaller. Meanwhile, attitudes in advanced economies have been relatively steady between 2007 and 2014. Even with the global recession and the decline in growth rates among advanced nations, reported well-being changed by less than five percentage points in Japan, Italy, South Korea, the U.S. and the UK. The one country that experienced a double-digit decline in satisfaction over the course of the recession was Spain. Meanwhile, Germans have become considerably happier over the same time period. Just as richer countries are generally happier, those countries that experienced more GDP growth between 2007 and 2014 have also seen the biggest increases in life satisfaction over the same time period. For example, Malaysians had some of the highest economic growth since 2007 among the countries surveyed and they exhibited one of the biggest increases in life satisfaction. At the other end, the Spanish economy contracted between 2007 and 2014, and life satisfaction in the country decreased significantly. While there is a clear relationship between GDP growth and change in well-being, China is unique in the magnitude of such shifts since 2007. China’s GDP grew by an average of 10% and life satisfaction increased by 26 percentage points over the past seven years. Percentage point change between 2007 & 2014 in percent saying 7,8,9 or 10 on the ladder of life is on the vertical axis. Average GDP growth between 2007 & 2013 is on the horizontal axis. There is also a strong relationship between wealth and life satisfaction among individuals within a country. Richer people are more likely than poorer people to report being happy with their current life situation. This manifests itself in the survey in two ways. First, higher income individuals rate their well-being more highly than lower income individuals.6 For example, 68% of higher income Germans rate their current situation at seven or higher on the ladder of life, compared with 48% of lower income Germans. The difference between higher and lower income individuals is significant in 28 of the countries surveyed, and the gap is 10 percentage points or higher in most nations. Second, individuals with more key household goods are happier than those with fewer of these goods. The survey asked respondents whether their household had each of the following nine items: a television, refrigerator, washing machine, microwave oven, computer, car, bicycle, motorcycle/scooter and radio. The more items a person has on this list, the happier they tend to be.7 For example, in South Africa, 62% of people who have more household goods say they are satisfied with their life situation, compared with just 39% of people who have fewer of these possessions. The difference is significant in 37 of the countries surveyed, and again, the magnitude of the gap is 10 percentage points or higher in most countries. The number of household goods an individual has is clearly related to their income. Nonetheless, multivariate regression analysis shows that the number of goods a person owns has an impact on their reported well-being even when controlling for income levels. So, if two people make the same amount of money, the person who owns more of these key household goods will, on average, be happier. For more details on this analysis, please see Appendix B. In emerging and developing economies, people are most satisfied with their current health (global median of 70% saying 7,8,9 or 10) and the personal aspects of their life, including their family (69%), religion (68%) and social life (65%). Somewhat lower down the satisfaction scale are neighborhood safety (62%), the quality of schools in their community (57%), their standard of living (54%) and present job (54%). Nonetheless, there are clear regional differences. In Asia, religion tends to be the area of life where individuals receive the most satisfaction. Roughly eight-in-ten or more in Indonesia (90%), Malaysia (85%), the Philippines (80%), Pakistan (79%) and Thailand (78%) say they are happy with their religious life. In China, health (79%) pops up as the most satisfying, while in Vietnam it is the safety of their neighborhood (77%). In India, the highest rated aspect is their social life (69%) followed closely by their health, family and religion (68% each). In nearly every country surveyed in Asia the lowest ratings go to either their present job (regional median of 60%) or their standard of living (58%). Similarly, most publics surveyed in Africa say religion is their happiest area of life. Senegalese (92%), Nigerians (84%), Ugandans (78%) and Ghanaians (78%) are the most satisfied with their religious life. And, as in Asia, African publics rate their standard of living and job lowest. Roughly a third or fewer in Ghana (34%), Kenya (25%), Uganda (25%) and Tanzania (17%) say they are happy with their material well-being. Middle Easterners also give their standard of living dismal ratings. Just 31% of Tunisians, 27% of Jordanians and 20% of Egyptians say they are happy with their material well-being. Across all 33 emerging and developing countries, Egyptians tend to be among the least satisfied with every aspect of life asked about. The area that publics in the Middle East are most satisfied with varies considerably across countries – Tunisians are happiest with their family (76%), Turks (73%) and Jordanians (57%) with their neighborhood safety, Palestinians with their religion (71%) and Egyptians are split between their religious life and their health (49% each). In Eastern Europe, Poles (75%) and Ukrainians8 (62%) are most satisfied with the safety of their neighborhood while Russians cite their family life (56%). Again, standard of living is the least satisfying in Poland and Ukraine, with Ukrainians especially unhappy with their material well-being (27%). Russians, meanwhile, are least happy with their religious life (35%). Latin Americans differ from people in other regions in their concerns. In five of nine countries surveyed, people are least satisfied with the safety of their neighborhoods, including just 49% in Argentina, 47% in Venezuela and 45% in Brazil. Chileans (49%) and Peruvians (46%) also rate their neighborhood security poorly, but they are even less satisfied with the quality of the schools in their communities (39% and 40%, respectively). Consistent with other publics around the world, however, Nicaraguans (60% standard of living and job) and Salvadorans (54% job) are least happy with the economic aspects of their life. Across all countries surveyed in Latin America the area that brings the most joy is their family (regional median of 83%). There are some clear demographic divides in who is happy and who is not with the different aspects of life. In nearly all countries, young people (age 18-29) are considerably more satisfied with their health than people age 50 and older. And in many countries, higher income individuals and those with more education are happier than lower income and less educated people with their standard of living, job, health, social life and family life. Income and education differences do not emerge in most countries when it comes to religion, neighborhood safety or schools. While, in general, people in developing and emerging nations are happier with the personal aspects of their lives than with the economic ones, it is satisfaction with their standard of living that has the biggest impact on their overall happiness. People who rate their standard of living highly are much more likely than people who rate it poorly to say they are doing well. This relationship holds even when controlling for demographics and satisfaction with other aspects of life. For more details on the results, please see Appendix B. Many people in emerging and developing nations believe they have made progress in recent years. Asian publics in particular say they are now better off when asked to rate their lives today and their lives five years ago. At least half in Bangladesh, China, Vietnam, Thailand, Malaysia and India express this sentiment. Many publics in Africa and Latin America also think they have made progress over the past five years, though considerable percentages rate their current situation as worse. Brazilians, in particular, think life is better today. Ghanaians, on the other hand, are the most likely across all 33 emerging and developing countries to say they are worse off. Eastern Europe and the Middle East see less progress and more lost ground. Nearly half in Ukraine say their life is worse today than it was five years ago. At least four-in-ten in Egypt, Tunisia and the Palestinian territories say the same. In general, the countries where more people perceive they are better off today are the same countries where there has been a bigger increase in life satisfaction between the 2007 and 2014 surveys. For example, 66% of Chinese in 2014 say their life today is better than five years ago. Between the 2007 and 2014 surveys, the percentage of Chinese who rated their present life a seven or higher jumped by 26 percentage points. Egypt has one of the lowest percentages of people who say they have made progress in the past five years (32%). And between the 2007 and 2014 surveys, the percentage of Egyptians who say they are presently high on the ladder of life dropped 14 points. Just as Asian publics are the most likely to say they have made progress in recent years, they are also the most optimistic about the next few years (regional median of 68% optimistic). In particular, broad majorities of Bangladeshis, Thais, Indonesians, Chinese, Filipinos and Indians expect their life in five years to be higher on the ladder than it is today. Pakistanis are considerably less sanguine about the future, but many say they don’t know where they will stand in five years (32%). African nations are a very close second when it comes to optimism (regional median of 66%). Broad majorities in six of the seven African countries surveyed say their life will be better in five years. The one exception is South Africa, where half are optimistic for the future. Still, just 18% in South Africa think things will be worse. Latin Americans are also generally positive about the future, especially Brazilians, Colombians, Peruvians and Nicaraguans. Salvadorans, Venezuelans and Mexicans are somewhat more pessimistic, with roughly two-in-ten saying life will get worse for them personally. 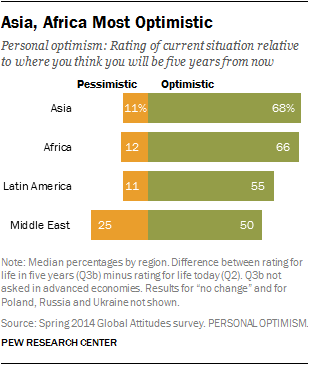 People in Eastern Europe and the Middle East tend to be more pessimistic about the next five years. Egyptians, Jordanians, Palestinians and Poles are the most likely among all 33 countries to say their life will worsen. The analysis of who is happy – and who is not – reveals that people with higher incomes and more household goods are more satisfied with life in general. But when individuals were asked to rate on a scale of 0 to 10 what is most important to them in life, nonmaterial things, such as good health (global median of 68% saying “10 – very important”), quality education for their children (65%) and safety from crime (64%), top the list. Still, owning a home (62%), a comfortable retirement (53%) and a fulfilling job (53%) are also ranked highly. Less important tends to be helping others (39%), owning a cell phone (39%), having free time for yourself (38%) and owning a car (34%). At the bottom of the list is being able to travel (29%) and having internet access (24%). Good health is – or ties for – the most important thing to have in life in 22 of the 33 countries surveyed. Similarly, internet access is – or ties for – the least important thing to have in life in 21 countries. These patterns hold across all regions surveyed. Nonetheless, a few publics break the mold. Jordanians, Egyptians, Brazilians and Pakistanis tend to say safety from crime is more important than good health. Thais, Colombians, Argentines and Peruvians rank their child’s education as the highest priority, while the Indians and Tanzanians value both education and owning a home equally. Russians say helping others is their lowest priority, while being able to travel is least important to Poles, Tunisians, Thais, Vietnamese, the Chinese, Chileans, Nicaraguans, Tanzanians and South Africans. Access to the internet ranks low on the priority list for most publics. However, there are stark differences by age and education in the importance of the internet. In most countries, young people and more highly educated individuals assign higher priority to accessing the internet than older people and less educated individuals. For example, in Chile, 54% of 18 to 29 year olds say it is very important to be able to use the internet compared with 17% of those age 50 or older. Large double-digit gaps in attitudes between the young and old on internet access also exist in Ukraine (+32), Poland (+28), Thailand (+28), Brazil (+27), Russia (+25), Tunisia (+25), El Salvador (+24), Turkey (+22) and Malaysia (+23). Similar differences by education exist in Chile (+27), Tunisia (+23), El Salvador (+23) and Senegal (+23).